Road trip season is nearly upon us! It’s such fun to hit the open road and travel. Whether your road trip takes you to visit family, check out a new attraction, take in the views of a national park, or just wander until you hit upon something of interest, being prepared makes all the difference for a successful road trip. Let’s break the road trip essentials down into three sections- vehicle prep, food, and necessities. Obviously, the first road trip essential is a vehicle to travel in! Doing some vehicle prep work ahead of time will save many headaches, along with $$$ in costs that could be alleviated with simple, routine maintenance. Thankfully, my hubby does all of the routine maintenance on all of our vehicles. His favorite brand of filters has always been FRAM. The first step to replacing an air filter is to locate the air filter housing. Remove the clips from the top of the housing. Disconnect the hoses leading to the housing. With the top of the housing removed, the worn-out filter is now exposed. Simply lift the filter out and dispose of it. Install the new air filter by placing it into the housing, ensuring it is seated properly in place. See how simple that job is to do?! One of the most overlooked filters to replace is the air filter. Dirty air filters restrict airflow, which can contribute to decreased acceleration, horsepower, and reduced overall performance. Give your vehicle a break and replace that filter! It’s a one-stop shop to stock up on vehicle maintenance needs at WalMart. Saving money and time are both high on my priority list. I can usually find all of the products necessary to maintain our vehicles at one store. I’ve included a free printable checklist of vehicle care for you. Grab it at the bottom of this post! Next up is my favorite part of road trip planning- the food. By packing food for your trip, you’ll avoid the over-priced, less-than-healthy foods at convenience stores. You’ll also save time by not having to search for snacks or restaurants. While a planned stop for a meal at a restaurant is a good thing, unexpected stops due to hunger are something else. Some of our favorite road trip foods to pack are: cheese sticks, individual baggies of fruit & vegetables, lunch meat cut into pieces, small containers of peanut butter, small containers of Ranch to eat with the vegetables, pretzels, protein shakes, and water. We have found that packing individual baggies of snacks, along with packing Ranch and peanut butter into small containers makes portion control easier. It also makes keeping the vehicle clean easier. We try not to over-pack food as it is so easy to mindlessly snack while driving. We pack enough to keep hunger at bay, but not so much that we end up with wasted food. How about all of those items that you have at your disposal while at home, but somehow forget to pack into the vehicle? The necessities make a trip more enjoyable. Items such as eyeglasses cleaner, pillows, blankets, hand cleaner, cleansing cloths, notebook, pens, trash bags, and such are great to have with you on a trip. Other items that are necessary for a road trip include cash, change for toll booths, map (even with a GPS, I like to have printed maps- to get an overview of our trip and also in case we decide to take a detour or side trip), music, books, podcasts, and DVDs (if you have a DVD player). If you are traveling with small children, here are some additional items to pack– small treats to be given out at a certain hour or mile achievement helps to pass the time and gives the child something to gauge the passing time. Another super helpful tip is to pack a potty chair and plastic shopping bags. Trust me, this will be a huge time-saver for you! And finally, what will you do for entertainment besides look out the window, or look at a screen? Take along a few games to play individually or collectively to pass the time. Games played together add more memories to the road trip. Isn’t making memories one of the reasons that you take a road trip?! Two of our favorites are magnetic travel games and Mad Libs. I hope these tips will make your next road trip a huge success! Get out there and see the sights with your family! 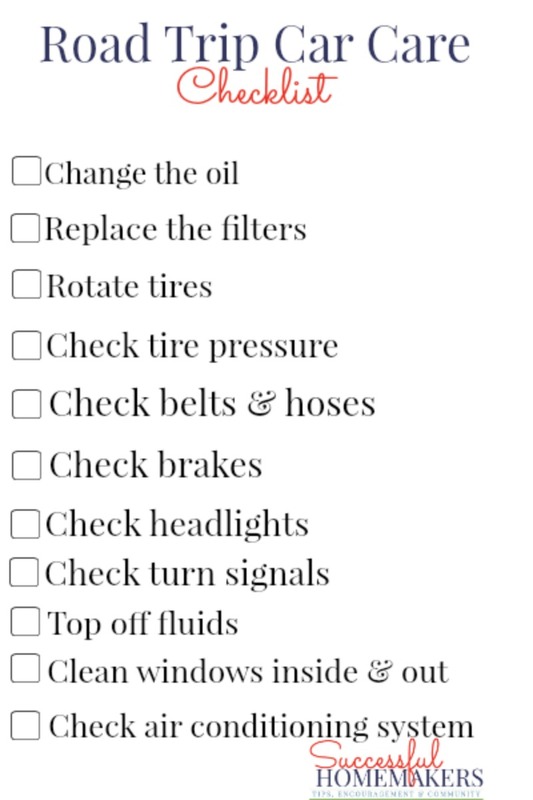 To print your car care checklist, click on the image below or this link. Interestingly enough, we are planning a cross-country road trip this summer, so of course I HAD to click on your post and see what helpful tips you offered…and what helpful tips indeed! I especially appreciated the tips on bringing snacks and entertainment to pass the time! That’s a long time to be in the car and I know I don’t want to be searching in the middle of nowhere for a decent place to eat and I certainly don’t want to hear “Are we there yet?” a million times from our 9 year old, so thank you for sharing these helpful tips as we get prepared for our journey!